I have not been devoted to my blog lately. Last post was older than a month ago, and despite the excuse of being overly busy and in my defense I was still in the mourning period (hint: when one of your favorite friend left the world too soon, apparently it hurts real bad) – and the fact that I had developed a new hobby (amazingly, Squash) pretty much explain why blogging was probably the last thing on my priority list. But I do miss writing. I miss looking at mouthwatering photos and get excited to share them on blog. I guess I was waiting for that particular euphoria that would bring back all my appetite to eat and write. The kind that offers sophistication, naturally good-looking food, and new ambiance for the sake of self-recuperation. And for me, that’s when PAUL comes to the rescue. In case you’ve never heard of the name, Paul is a French chain of bakery/restaurant founded since 1889 in the Northern France. 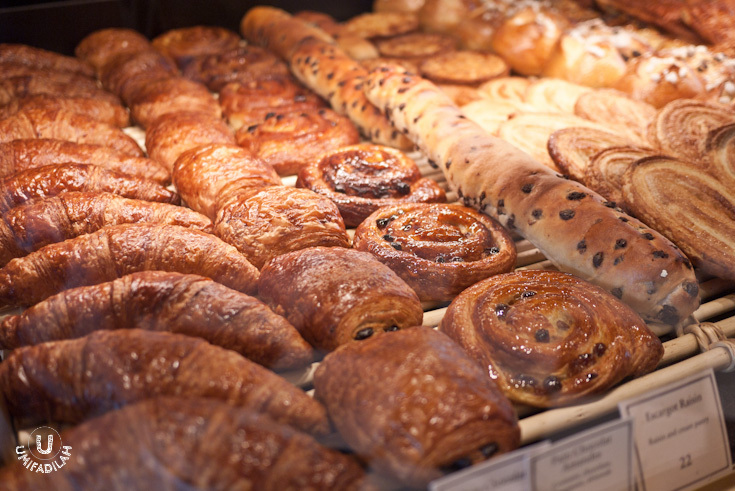 As of now, Paul has a network of over 450 bakery-patisserie across the world, undoubtedly one of the largest French bakery brand that is globally recognized to date. Just opened few weeks ago, Paul finally made their way to the heart of Jakartans through this spacious outlet located near the South Lobby of Pacific Place, facing the entrance to Galeries Lafayette. Looking elegant in an all black and white décor, the outdoor building stands up proud and tall, screaming only one thing: Sophistication. Just wait until you pull the door open, the delicious smell of their freshly baked bread is bursting out your way seeking for attention. Such a welcoming greeting. It’s overwhelming to acknowledge that Paul has hundreds (140, to be exact) of different bread & cake selections, all said to be without artificial additives or preservatives. And being established for over 124 years itself is a fact that they worth more than just a momentarily hype. From plain and fancy bread, Viennese pastries, to the dessert world of cakes and flans, trust me, one visit will never be enough. Plain croissant (regular and mini version), and mini Escargot aux raisins. Can you tell based on its appearance above? Yes. And the best part is actually something that you can’t see here. THE BUTTER. I don’t know what type of butter they use here at Paul but in the name of Pastry God I swear it’s delicately fragrant and it just adds up to the whole croissant-eating experience. Left to right: Fougasse Provencale (with sundried tomatoes) – Fougasse 2 Olives (with black & green olives) – Fougasse Cheese. All priced at IDR 25k. Yes, you can buy bread in the Bakery section and eat them in-house. BUT, if you're sitting in the restaurant area, please note that you can still order those pastries/bread/cakes WITH additional service charged. 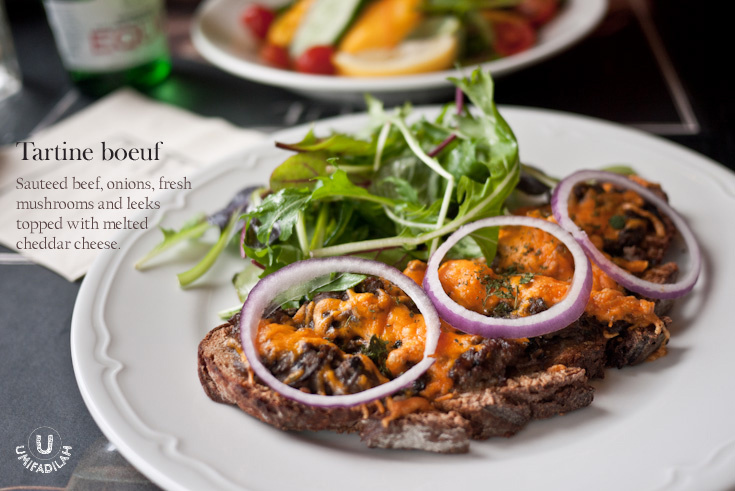 Appetizer – Savory Range (Nos plats boulangers): Sandwich, open sandwich with Tartine, buttery puff pastry known as Tourte, soup, all kinds of croque-monsieur, French crepe, potato pancakes or Paillason, and salad. Main Courses (Nos plats du Chef): not much selection here, only 6 menu consisted of meat and fish. Croque-monsieur (IDR 90k). Turkey ham, Emmental cheese, cream served in between two slices of pain de mie (pullman loaf/regular sandwich bread type) with mixed green salad on the side. The winning element? The Turkey ham, of course. It plays really well along the subtle cream cheese and the melted emmental. I’d happily order this one again next time if I weren’t so curious with other menus as well. 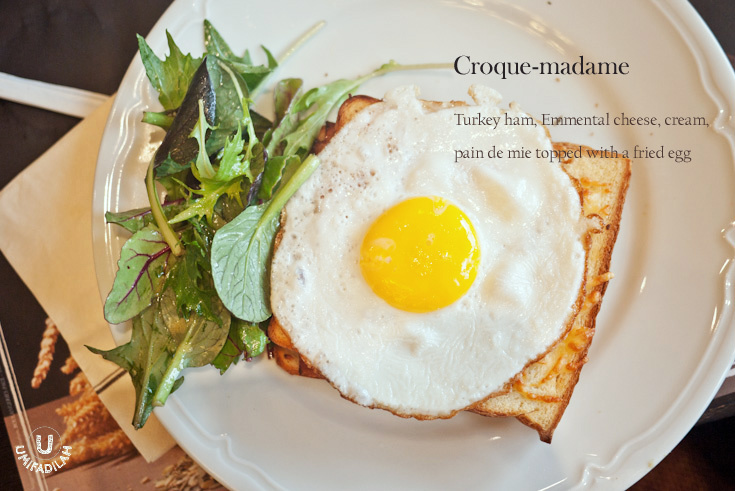 Croque-madame (IDR 95k). It’s pretty much the same thing as croque-monsieur except with a fried egg on top. Tartine boeuf (IDR 125k). Sauteed beef, onions, mushrooms and leeks topped with melted red cheddar cheese. The winning element? The tartine bread! It has a really, really nice texture I find myself quite surprised as I finished the whole meal. The outer part is very crunchy but as you get into the middle part it gets softer with all the toppings combined, resulting in a delicious interplay of texture. Love! Tartine poulet curry (IDR 115k). This was my friend’s order and I didn’t get a chance to actually taste it, but if you were looking for something bold, I don’t think curry plays a major role in French dishes, so yeah… Don’t get high-hoped. Salade crevettes mangue (IDR 100k). One of the most beautiful thing to order from their menu. Seriously: perfectly grilled prawns, mixed greens, carrots, mango, cucumber, cherry tomatoes – every element has a distinct bold color that stands out among each other. Drizzled with light vinegar dressing this dish is not only beautiful but is guaranteed to refresh your taste buds. Oh, its huge portion made it perfect for sharing, too. Lemon cream tartlet (IDR 50k). Good crust, and balanced flavor of the lemon custard. Éclair aux framboises/Raspberry Eclair (IDR 50k). This. Was. So. Delicious! Not a single thing goes wrong with Paul’s éclair. Perfect texture of the choux pastry, fresh raspberries and oh the not-overly-sweet custard cream served at the perfect chilled temperature….. MOUTHGASM. It’s as good as Cacaote’s version of éclair, a bit pricier (50k versus 38k-ish) but also way bigger than theirs. But Cacaote has the Salted Caramel Eclairs which I really love! Will I pay more visit in the future? Most likely YES. First, location wise – it’s right in front of my office building. Second – they accept MAP Vouchers, LOL (it definitely brings radical changes because before Paul existed, the outlets eligible for these vouchers were so limited I frankly got bored with basically all of them). 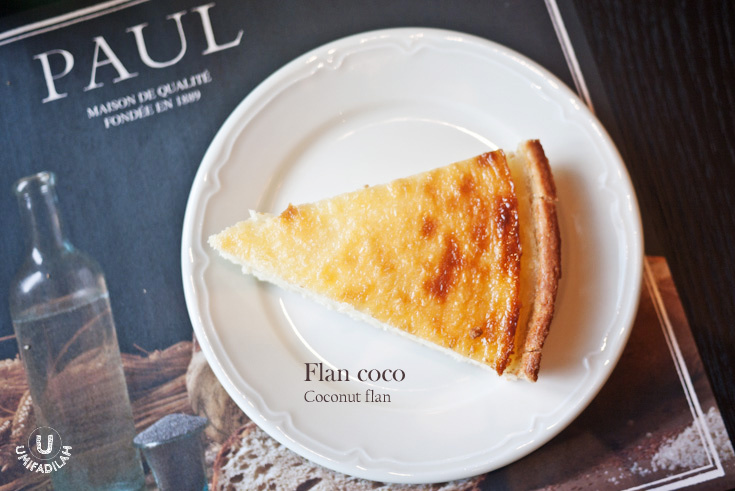 Third – fine bread, pastry and cake selection with cozy place, come on, WHAT’S NOT TO LOVE? I’ll tell you what’s not to love. In the end, I am more than pleased that they're here. You should've seen my face whenever I'm eating those Fougasse Olives, LOL.